Stay and play at a place so grand that you could spend your entire Grand Strand vacation without leaving the property. That’s the experience the Sand Dunes Resort in Myrtle Beach gives its guests – clean, comfortable oceanfront accommodations and all the amenities to make your Myrtle Beach vacation a memorable one. 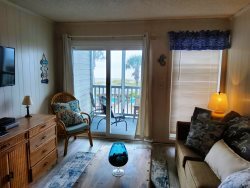 Located in the exclusive Dunes neighborhood, Sand Dunes Resort & Spa provides a relaxing environment and a wide selection of accommodations, including fully furnished and smartly decorated one-, two- and three-bedroom condos, suites and villas. Enjoy an ocean view from your private balcony or relax on the beachfront patio deck with a frozen drink from the bar, or unwind your body and mind with a day at the spa. pools, picnicking, sand & sun ! Greater Myrtle Beach is a paradise for shopping, sports, live entertainment, dining & doing. Come for the stay, & be swept away ! Kiddie waterpark located in parking lot NOT included.